February 2018 - Soyoun Park, who was born in Korea, fell in love with French pastry 12 years ago during a trip to France. 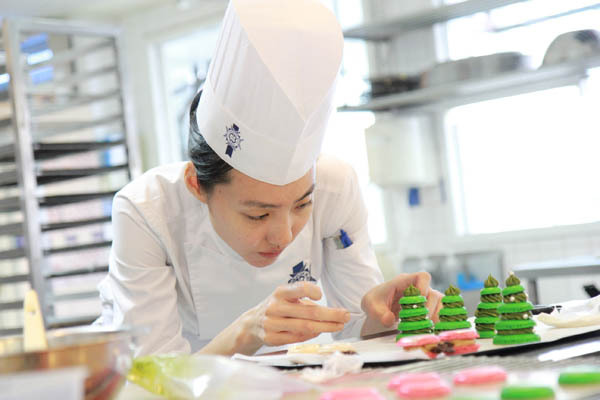 Since then, she decided to dedicate herself to teaching and began her career at Le Cordon Bleu Thailand institute. In 2016, she joined the Paris team of Chef Instructors to teach pastry. I began working in pastry 13 years ago, in 2005. It was during my first trip to France and the city of Paris. I fell in love with French pastry. I stayed in France for 8 months and visited many regions where I gained a real understanding of products from the terroir. I then took part in a cuisine workshop at Le Cordon Bleu Paris: an amazing experience! I lived in Seoul at that time, where I was a professional ballet dancer. My parents didn't agree with my decision to enter into the world of pastry, they didn't think it was something I could make a career out of. I was already aware of the reputation of Le Cordon Bleu. My time in France made me even keener on the institution. I discovered the Thailand school during my travels and decided to register there. I took both the Cuisine and the Pastry Diploma at Le Cordon Bleu Thailand institute between 2008 and 2009, and was part of the first ever graduating class at Le Cordon Bleu Thailand school. I finished my training programmes in 2007 and returned to Korea to work in a hotel chain. In 2009, one of my cuisine chefs came and asked me to come and work with him at Le Cordon Bleu Thailand school, in the prep team. I worked at the Thailand institute for 3 years, before leaving to open a tea room with a French friend, where we served French pastries. I remained there for 2 years (from 2012 to 2014). It was an experience which enabled me to perfect my pastry knowledge and techniques. Then, in 2014, Chef Danniel contacted me to come and join his team at Le Cordon Bleu Thailand institute and I returned in the position of pastry Chef Instructor. Finally, in April 2016, Chef Danniel, who was appointed Head of the pastry department at the new Le Cordon Bleu Paris institute asked me to come and work with him as pastry Chef Instructor in Paris, France. I was working in cuisine at the time but was passionate about pastry. I decided to make my own opportunities by taking the plunge and opening my own tea room. I was 25 years old and found my own way with nobody to teach or guide me. I had to find and fit-out the premises, decide what I wanted to sell, etc. To perfect my techniques and know-how, I had to work even harder, constantly practise and be inventive. Working alone was highly pressurised and I needed to evolve, compare my work with that of others. I therefore accepted to return to working in a company, as part of a team of chefs. I give practical classes to pastry students, pastry workshops, and come up with new creations for Le Café. I also work on the creative side of things in the lab, coming up with new recipes which will be taught at the school on the Pastry Diploma. I am quite passionate, there is so much I want to achieve. Everything is different and I enjoy everything I do, I get something out of each task. My creations in the lab or for Le Café enable me to get hands-on, giving me the opportunity to practise my skills and to continue learning. I chose to teach because I love being with people. We meet and teach students with unique personalities and from different backgrounds. I enjoy sharing my knowledge and it is really interesting to do it at Le Cordon Bleu school because people come from a wide range of professions (doctors, lawyers, entrepreneurs...) and from all over the globe. I was in that very same boat, a dancer before entering this profession. I believe the most important thing, above all, is to be passionate. Despite being a very tiring job, if you are passionate enough, you will succeed! You need to be a good communicator and know how to work in a team, it is vital if you want to succeed. Lastly, you need to be very flexible and adaptable, there are often unexpected situations and problems in cuisine, you need to be able to think on your feet and find effective solutions. I am also self-taught, I read extensively, experiment, try out my own creations. What, in your opinion, is the role of women in the world of chefs? It is wonderful to see women succeed in the world of chefs. The emotional sensitivity in the dishes produced is clear to see. Female chefs such as Claire Heitzler, who adds a touch of femininity and elegance to pastry, and Anne Sophie Pic are shining examples. You need to think of how hard they must have worked to get to where they are today. However, female chefs are still not widely enough recognized in the field. I believe that things are evolving and will have changed in 10 years time because the younger generations already have more female chefs in their ranks. I can already see a significant difference between my generation (in their thirties) and the one that followed (in their twenties). This is the case all around the globe. Personally, when I launched my career I found that it was even harder to prove myself and succeed due, not only to the fact that I was a woman, but also that I was from a younger generation and lacking experience. I was totally committed, determined and ploughed all my energy into making my project a success. What advice would you give to a woman who wants to make her mark as a chef? I would advise them to always keep a smile on their face, to do their job well and meticulously. It is important to stay strong, never show your vulnerable side and to not let your emotions take control. This is a job in which passion is crucial, and that is what has always enabled me to remain strong despite the obstacles with which I was faced! My passion outweighed everything else. First cuisine memory? The New Year family meal, which is an important celebration in Korea! I have been helping my parents prepare for this event for the past 3 years running. Favourite smell in cuisine? Caramel or nut brown butter. One Chef, if you could only choose one? Angelo Musa, I love his creations for their flavour balance, it is just perfect. I also really like Philippe Urraca. An exceptional dining experience? I love small restaurants, I was once in a restaurant in the mountains of southern France. A wonderful memory, it was run by a couple and had recently been awarded a Michelin star. Their style revolved around mountain products and local cuisine. French or world cuisine? World cuisine with French techniques (ex: Asian flavours like shizo can be used in pesto or cream). An anecdote about your career? I never stop learning and that will always be the case, even 10 years on, I still learn something new every day! It is important to maintain this mindset because it enables me to grow on a daily basis.